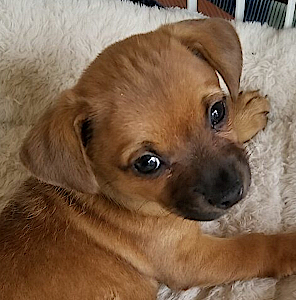 Puppies less than 16 weeks old cannot be placed in apartment complexes as they cannot go out in communal areas until about 10 days after their last vaccine at 16 weeks. Introducing little Alice…who has loved living in a Wonderland since she arrived at SBRET. 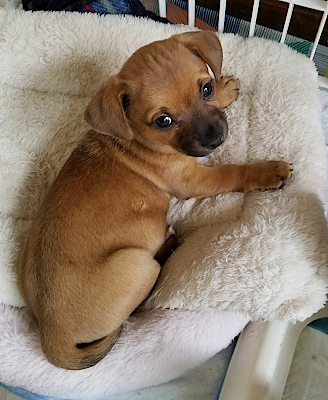 She is most likely a Chihuahua/Dachshund mix, but honestly, she could be another mix. Her bottomline is that she is as cute as a button and so very, very smart! She is practically potty-training herself. We don’t know her birthday of course, but as of the beginning of April, she is approximately 7 weeks old and weighs about 3 pounds. 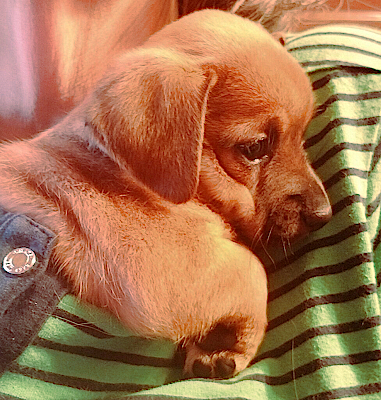 She has a strawberry-blonde coat, a dark muzzle, the tiniest white blaze on her chest, little puppy wrinkles on the top of her head, and feels like velvet suede. Short little legs, a huggable roly-poly body, and darling floppy ears make her irresistible to hold and love. 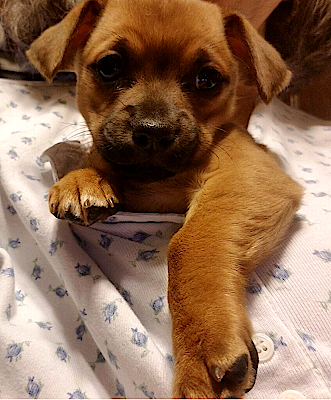 Her foster furbuddies have been working hard to teach her the social skills that mommies teach puppies. Because she’s so smart, she is learning quite quickly to play nicely with people, other dogs, and cats. She will need someone to continue learning appropriate play. She responds to her name and is starting to “Come” when called. She LOVES to play with puppy toys and snuggle in a blankie. 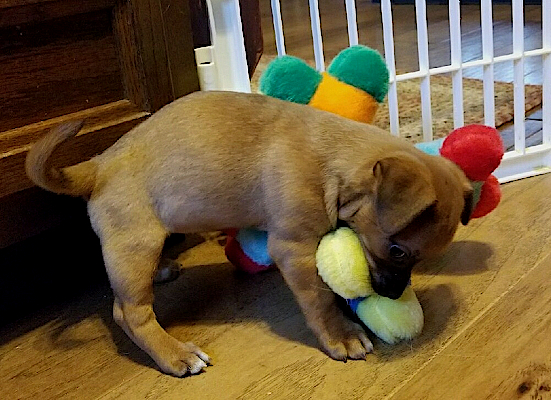 She goes outside to potty (on a regular schedule) and will need her forever home to have someone home part of the day to continue her potty training. She is pottying on her weepad in her expen so that her playpen stays nice and clean. A secure area in your home while she is growing up will be best for her. She will need a good quality puppy food (kibble is fine) for the rest of her first year, and her new family will need to finish her puppy shots and start her heartworm/flea treatment when it is time. Alice is tiny and would do best in an adult home or one with children over 6 years old. A home with another playful dog and a fenced yard would make Alice’s new home a Wonderland too! She will be spayed, microchipped, and have had the shots appropriate for her age, but she will still need a few more after she is adopted. Her adoption fee is $175. If Alice is the right little fairy-tale girl for you, please contact sbret.com.